Bridget McNulty feasts on an array of Hue specialities in this traditional Vietnamese restaurant. When you walk into the Junrei Restaurant at Pilgrimage Village in Hue, Vietnam, the first thing you�ll notice is the d�cor. But the food, I assure you, is just as impressive. Still, it�s the restaurant itself that will take your breath away at first � a traditional citadel styled room held up by beautiful wooden pillars, carved as round and smooth as silk. 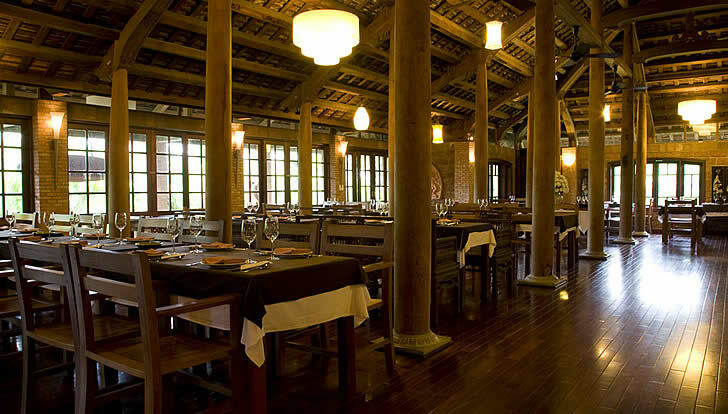 The pillars are actually the hearts of perfectly straight jackfruit trees (that last 300 to 500 years), and it took five years to find the perfect number of trees to hold up the restaurant�s vaulted ceiling. It also took a few years to carve all the intricate patterns into the many wooden beams that make up the restaurant frame, as they all had to be carved on auspicious days, to bring the restaurant good luck. It looks as if all that hard work was worth it, as Junrei serves up a feast of superb Hue delicacies to an entirely appreciative clientele. 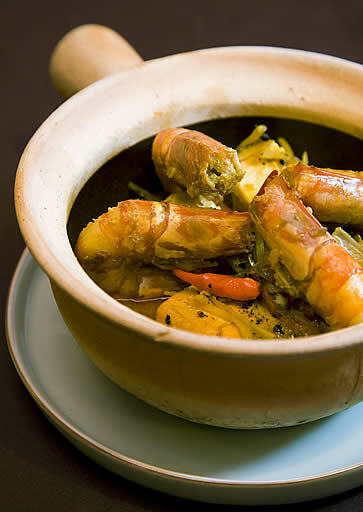 Hue is one of the few places in Vietnam renowned for its �royal cuisine� � food that used to be limited to royalty, but that is now available for everyone to eat. 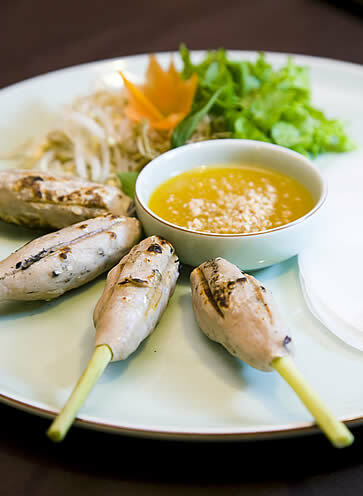 Certain dishes, especially those containing lotus seeds, are now part of the menu in this small city in central Vietnam, but only on special occasions. Our visit to Junrei was one such occasion. We began our meal with a stunning medley of starters � Hue Rice Patties (banh beo), Deep Fried Pork Spring Roll (nem ran) and Grilled Minced Beef wrapped in La Lot leaves (bo nuoung la lot), arranged around, and protruding from, a carved pineapple in which a votive candle had been lit. 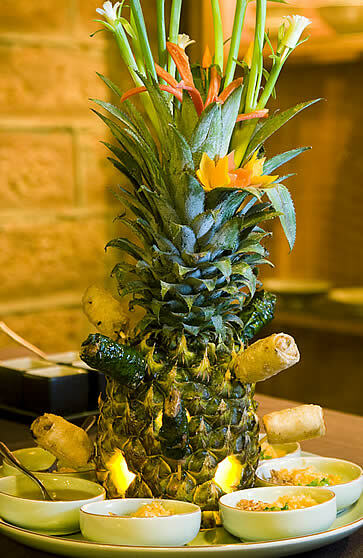 Even more impressive, the pineapple�s crown was adorned with miniature flowers carved out of lemongrass, carrot and red pepper, making the entire display something that would make even the most hardened diner gasp in delight. This was followed by a light, tasty bon rieu cua, a minced crab noodle soup with tofu, pineapple, tomato, herbs and mushrooms floating in the flavourful broth, and a feast of other dishes � Glazed Prawn with Honey and Garlic (ca kho to) Fish Fillet in Clay Pot (tom rim mat), deliciously tender and smoky grilled chicken, grilled minced pork on a lemongrass skewers (served with peanut sauce, rice paper and mixed greens), and lotus steamed rice with carrots served with saut�ed morning glory (also known as water spinach) topped with garlic and onions. It was a feast fit for a king. Those that stood out were the Grilled Mince Pork Skewers, shot through with the subtle flavour of lemongrass and perfectly complemented by the peanut sauce, and the Clay Pot Fish Fillet. This had to be one of the tastiest pieces of fish I�ve ever eaten in my life � large chunks of tender salmon that soaked up all the lemongrass, ginger, chilli and caramelized fish sauce in the clay pot to create a unique taste sensation. Simply splendid. To end off this feast of flavours, we were served a sweet lotus seed soup, accompanied by a banana and tapioca soup, which was light, sweet, and cleansing to the palate, a surprising but delicate medley of flavours that rounded off the headier tastes of the main course perfectly. And then, as is custom in this part of the world, there was a platter of fresh exotic fruits � mango, watermelon, dragonfruit and papaya. The ideal end to a matchless feast of Hue specialities. The service at Junrei is excellent: polite, friendly and ever-attentive, and the waitrons seem to take great delight in bringing out the beautifully decorated dishes � perhaps because the patrons all ooh and aah as their swans and flowers and pineapple lanterns are placed in front of them. Although it�s the d�cor you�ll notice as soon as you walk into Junrei, it�s the food you�ll be thinking of as you depart, having tasted a slice of royal Hue in a setting fit for a king. Opening times are from 6am to 10pm. Address 130 Minh Mang Road, Hue, Vietnam.